We’d love your help. Let us know what’s wrong with this preview of The Dream by Laura Miller. To ask other readers questions about The Dream, please sign up. For the very first time, I am dumbfounded how to rate this book or how to feel about it but I guess the title says it all! On the one hand, this was a truly well written book that captivates & breaks your heart, but on the other? That ending just killed it for me because when I read a romance, I want a HEA! What I don't want though is to (view spoiler)[ find that almost everything I read was a DREAM and that both MCs moved on from each other and are with others, while they still think and lov For the very first time, I am dumbfounded how to rate this book or how to feel about it but I guess the title says it all! This dream is a reader’s nightmare. For this reader IT IS. Paula I liked the cover. Does that count for anything? 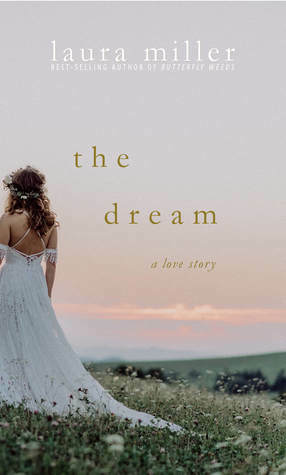 The Dream begins as a coming-of-age story that is brimming with the possibilities of young love. It’s a story of warm summer nights, stole No one writes small-town romances like Laura Miller. In fact, this is my favorite book by her. Laura Miller is an author that I love to read. She writes books that pull me in and don’t let me out until the very last page. The Dream is a perfect addition to my library. I started the book, fell in love with the characters, became invested in the storyline, and has stayed with me even now that I have finished the story. Everton and Delilah have a love story that starts as teenagers and carries them throughout their lives. They enter each other lives, they leave each other lives, and they lov Laura Miller is an author that I love to read. She writes books that pull me in and don’t let me out until the very last page. The Dream is a perfect addition to my library. I started the book, fell in love with the characters, became invested in the storyline, and has stayed with me even now that I have finished the story. Everton and Delilah have a love story that starts as teenagers and carries them throughout their lives. They enter each other lives, they leave each other lives, and they love each other forever. My heart was crying for these two. The love between them started with just a look and it became all-encompassing, it became their reasons for breathing, and I loved their story. I love Laura Miller books. But this one fell short for me. This was so heart wrenchingly beautiful! Its the kind of story you read once and then treasure it in your heart for the rest of your life! I fell in love with Everton’s and Daisy’s story! It starts with a simple summer when Daisy first meets Everton and from the first moment you can tell he has already found a place in Delilah’s heart. It’s not love at first sight it’s more like intrigue at first sight. Eventually through secret dates and nights at the lake they fall in love. My heart broke into This was so heart wrenchingly beautiful! Its the kind of story you read once and then treasure it in your heart for the rest of your life! I fell in love with Everton’s and Daisy’s story! It starts with a simple summer when Daisy first meets Everton and from the first moment you can tell he has already found a place in Delilah’s heart. It’s not love at first sight it’s more like intrigue at first sight. Eventually through secret dates and nights at the lake they fall in love. My heart broke into pieces when they were separated. I don’t want to spoil the rest of the story so I’ll just leave it here and just tell you that they do meet again! Everton is every girl’s dream. He’s sweet, handsome and has a poetically wise touch to his thoughts. I think i fell for him even before Daisy did! Daisy on the other hand is a girl with a big beautiful heart who fell hard for the one guy she couldn’t have. Laura Miller’s books are special. The writing is poetic enough that You feel the breeze run through your hair, you hear the crickets and you almost see the stars in the sky. For a while it feels like you’ve borrowed the hearts of the characters and you feel everything they go through as if it was your story. I am not the kind of person who cries often but this book made me sob! It also made me laugh and go “Awww” and then it made cry a bucket of tears. It took me on an emotional roller coaster. That summer with Daisy and Everton stays with you long after you’ve closed the book covers. It is an absolutely beautiful book and honestly you won’t fully understand how deeply heart touching it is until you read it! 🇺🇸 My heart is so full after reading this book. It was a beautiful way to dream along. Its simple, but beautiful plot about a small town family, carries more meaning than you could imagine. I just don't know how Laura keeps doing it. Playing with the words in such marvelous way that each letter gets drenched in all those feelings that are meant for the reader to feel. ⠀ 🇺🇸 My heart is so full after reading this book. It was a beautiful way to dream along. "The Dream" tells Delilah and Everton's love story. Throughout the pages, you will get even more certain that you got trapped in a heart-melting trap. Mostly because the author has a genuine way of turning something simple into meaningful events in the blink of an eye. Going outside to watch the stars in a summer night will never be the same. Trust me. P.S. I'm still trying to recover from that plot twist that were those two epilogues. Depois de um bom tempo sem conseguir ler nada, "The Dream" fez o trabalho muito bem e me ganhou logo nas primeiras páginas. Sua narrativa simples, mas linda, sobre uma típica família de cidade pequena, carrega mais significado do que você poderia imaginar. Eu continuo sem saber como Laura consegue fazer isso. Brincar com as palavras de uma maneira tão maravilhosa que cada letra vem encharcada por todos aqueles sentimentos que o leitor precisa sentir durante a leitura. I love Laura’s small town stories and this one took my heart away with it. This story was so close to my heart that I know it will never leave because it gave me the same emotions as the boy I first loved but our paths never lined up right either. I get to be friends with him but the same longing and heartbreak lasted the same.....more of the what if’s really. The banter with the sisters was funny and all too true as to how each sibling has a quirky “flaw.” The way they were tied into the journe I love Laura’s small town stories and this one took my heart away with it. The banter with the sisters was funny and all too true as to how each sibling has a quirky “flaw.” The way they were tied into the journey with Daisy and Everton gave it enough realism to know what it’s like to date with siblings around. Everton was so wise beyond his years but I do wish there had been just a little more into his character as he was growing up and into adulthood. Daisy, to me, was the typical oldest sibling and small town girl. She continued to develop with that same maturity and view in life through the book which was nice. This story was just unbelievably, heart wrenching! Laura Miller’s stories always move your heart and this one certainly does that...her stories come alive and take you captive. This one took a turn I didn’t see coming. I had to reread the epilogues twice just to make sure I got it. The emotional elements, the meaning of love at all levels and stages of life will make you think long after you finish. It was perfect once, I was able to restart my heart. A beautifully written love story. “Love is w This story was just unbelievably, heart wrenching! Laura Miller’s stories always move your heart and this one certainly does that...her stories come alive and take you captive. This one took a turn I didn’t see coming. I had to reread the epilogues twice just to make sure I got it. The emotional elements, the meaning of love at all levels and stages of life will make you think long after you finish. It was perfect once, I was able to restart my heart. A beautifully written love story. This is my first book from Laura Miller. What can I say, I fell in love with the sisters. Their silly banter is hilarious. Daisy and Everton are a dream. They loved each other when they shouldn't. God- how I cried when Everton was sent home. Typical for a dad to do. I continued reading hoping their paths meet again. I was jumping up in joy when they did, and they got engaged. Only later to realize it was only a DREAM. LAURA MILLER is the national best-selling author of contemporary romance. She grew up on a farm in a little Midwestern town. Now, she lives in Kansas City, Mo., with her weatherman husband. For signing dates, trailers and more, please visit LAURA MILLER is the national best-selling author of contemporary romance. She grew up on a farm in a little Midwestern town. Now, she lives in Kansas City, Mo., with her weatherman husband.